The workshop consists of seven topical sessions and one round table discussion about present and future status of the p-process. Each session includes an introductive talk and contribution talks. The focus of the school will be the understanding and application of nuclear reaction networks to astrophysical models for systems such as novae, x-ray bursts (rp-process) and supernovae (r-process). The main purpose of this meeting is to identify experimental opportunities for nuclear astrophysics at short-lived, high energy density plasma environments as will be available at the National Ignition Facility NIF. Frontiers 2010 workshop sponsored by the JINA is the third in a series of JINA meetings to bring together all JINA participants, collaborators, and other interested researchers to discuss recent and/or planned research in nuclear astrophysics. The Institute is open to scientists from all countries and at all levels (student to faculty) who are interested in further advancing their knowledge in rare isotope science, who are interested in scientific exchange in this area, and who are interested in contributing to the goals of the institute. Students will have ample opportunity to interact with the lectures outside the formal lecture period and in addition ECT* staff will be on hand to assist in tutorials and problem sessions. Students will have access to the computing facilities of ECT* and will be given the time and opportunity to continue work on their PhD project. The Nuclear Astrophysics Graduate Student Conference is a joint meeting between graduate students from the Universities of Notre Dame, North Carolina, and Michigan State. The conference is intended to be an opportunity to improve interaction between nuclear astrophysics students and provide the possibility for information exchange and hopefully follow up communication. The NuGrid approach is characterized by a commitment to forward modeling based on our physics understanding of the involved processes, verification and validation, and uncertainty quantification, including the important aspect of nuclear physics input. The school offered a refreshing and training course on R-matrix techniques with AZURE. The more general coverage of topics in nuclear astrophysics by the lecturers at this school is intended to broadly familiarize young theoretical and experimental nuclear astrophysicists with exciting and challenging current problems. The workshop is focused on subjects related to statistical nuclear physics. By bringing together scientists working in various areas of this diverse field -- including astrophysics, technology, theory, and experiment. In light of this special occasion we have invited a number of speakers to review historical development and present the latest experimental and theoretical results on low energy proton and alpha capture reactions for the CNO cycles in main sequence stars and stellar helium burning. It is the second in a series of JINA meetings to bring together JINA participants, collaborators, and other interested researchers to discuss recent and/or planned research in nuclear astrophysics. It is a collaborative effort between CARINA and JINA with the goal to develop an updated and unified nuclear reaction data base for modeling a wide variety of stellar nucleosynthesis scenarios. This workshop will review experimental methods for mass determinations, theoretical modeling of nuclear masses, and their implications for outstanding questions in both nuclear structure and nuclear astrophysics. The objectives of the proposed School are to enable younger researchers to gain the background knowledge and to provide real experience in the use of modern direct reaction methods and codes. Charlie Barnes is one of the great pioneers in the field of experimental nuclear astrophysics. On the occasion of his 85th birthday we are planning to organize this special workshop on the "Status of 12C(a,y)16O" to honor him and his contributions and achievements to the field. * The Workshop on Massive Stellar Progenitors "The Final Days of Burning"
This informal two day workshop is intended to bring together diverse parts of the nuclear astrophysics community interested in the physics of massive stellar progenitors and their ability to collapse and later explode as a Supernovae or make a GRB. This workshop covered the basic theoretical methods and computational tools used for shell model configuration mixing calculations. The emphasis was on a "hands-on" use of computer codes. This is the first of a series of meetings, to be held every other year, that aim to bring together all of JINA, JINA collaborators and other interested researchers to discuss current research activities. The primary aim of the Workshop is to bring together interested physicists from the areas of Astrophysics, Giant Resonances, and Heavy-Ion Reactions, to discuss current status of experiments and theoretical models related to nuclear incompressibility and the equation of state, and to explore what experiments might be needed to clarify some of the outstanding issues. JINA held a second special school on "Tools and Toys in Nuclear Astrophysics". The school focused on "Nuclear Reaction Network Techniques". The Joint Institute for Nuclear Astrophysics organized a workshop on "The Physics of the s-Process" on May 29 - June 12, 2005 at the Aspen Center for Physics, Aspen, Colorado, USA. This workshop intends to strengthen the communication and collaboration between four research directions to improve our understanding of s-process nucleosynthesis. This informal two day workshop is intended to bring together diverse parts of the astrophysical community interested in probing the extreme events of classical novae and Type Ia supernovae. Cosmology is one area of fundamental physics where the complementary perspectives of the physicist and the philosopher of physics have proven to be especially valuable. At Notre Dame, in particular, cosmology has long been a place where the research trajectories of physicists and philosophers have intersected. This conference celebrates that heritage at Notre Dame by bringing together seven scholars whose work has contributed to the ongoing dialogue between the two disciplines. This workshop focused on theoretical descriptions of the nuclear reactions that can be studied at present and future radioactive beam facilities, from low to relativistic energies. These facilities allow the study of reactions with exotic nuclei that have never been accessible before, providing challenges for reaction theory as well as important input for nuclear astrophysics. A two-day meeting was held at the University of Notre Dame, IN, USA on January 28-29, 2005 for members and collaborators of JINA to discuss the latest developments and present topics of interest in the physics of the r-process. R-matrix theory is one of the essential tools for reliably interpreting nuclear reaction and scattering data. This technique is particularly important for the extrapolation of low energy cross sections in nuclear astrophysics. The increasing need for the use of R-Matrix techniques requires special training and easily accessible general purpose R-matrix codes. * Symposium on "Nuclear Equation of State used in Astrophysics Models"
To provide a forum to improve the links between the nuclear and astrophysics communities performing such investigations, a symposium on “Nuclear Equation of State used in Astrophysics Models” was held at the 228th American Chemical National Meeting at Philadelphia. The symposium was sponsored by the Division of Nuclear Chemistry and Technology (DNCT) of the ACS and the Joint Institute for Nuclear Astrophysics (JINA). Los Alamos National Laboratory through funds from CSSE, IGPP, T-6, SciDAC SSC and the Joint Institute for Nuclear Astrophysics JINA (U Chicago, ANL, MSU, Notre Dame) organized a workshop on "Chemical Enrichment of the Early Universe" on August 9 - August 13, 2004 in Santa Fe, New Mexico. The workshop focused on questions and topics about the chemical enrichment of the universe from the formation of the first stars to the observations of low-metallicity stars in the Milky Way. In dedication to the memory of Manuel Forestini, JINA co-organizeed "The 7th Torino Workshop on Nucleosynthesis in AGB Stars" on 2nd - 6th August 2004 at Churchill College and the Institute of Astronomy, University of Cambridge, UK. An European workshop on "Advances and Challenges in Nuclear Astrophysics" was organized in collaboration between CRC, Louvain la Neuve (Carmen Angulo), PNTPM, Universite Libre de Bruxelles (Pierre Descouvemont) and the Joint Institute for Nuclear Astrophysics JINA (Michael Wiescher). 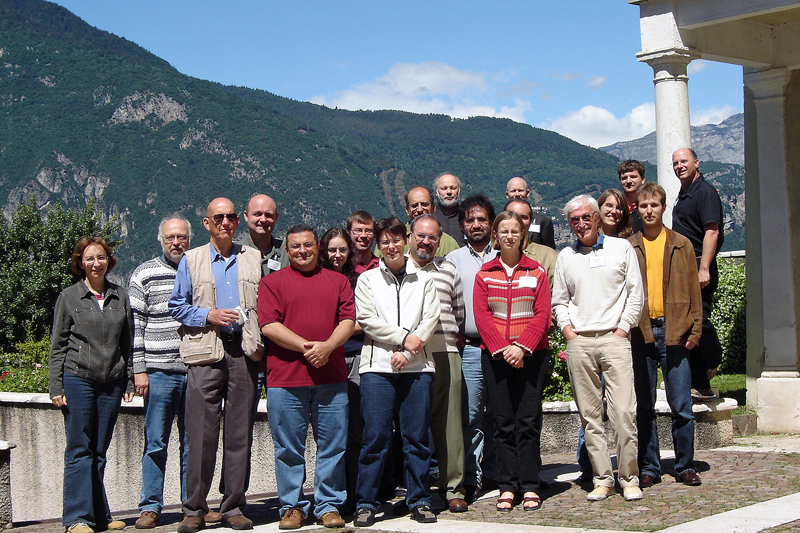 The workshop took place from May 24-28, 2004 at the European Centre for Theoretical Studies in Nuclear Physics in Trento, Italy ( http://www.ect.it/ ). This informal two day workshop was intended to bring together the JINA affiliated scientists and parts of the astrophysical community interested in probing the extremes of nuclear physics provided by the environment of accreting neutron stars. The workshop was held in the Small Seminar Room of Kohn Hall. "The r-process: the astrophysical origin of the heavy elements and related Rare Isotope Acclerator Physics" was held at Institute for Nuclear Theory, January 8-10, 2004. The purpose of the workshop was to discuss the technical requirements for the development of an underground accelerator. The goal was to establish communication and discussion between the experimental nuclear astrophysics community and accelerator physicists. The workshop addressed both the scientific goals and the technical requirements for the accelerator design and the associated instrumentation. Sufficient time and opportunity for discussion were given to the participants. The intent of this workshop was to bring together researchers with a diverse range of expertise - observational astronomy, neutrino transport, supernova hydrodynamics, experimental and theoretical nuclear physics - to attempt to identify critical outstanding question associated with our understanding of core collapse supernovae and the means by which they can best be addressed. With support from the National Science Foundation, and the National Superconducting Cyclotron Laboratory at Michigan State University. << Back to "JINA-CEE Sponsored Workshops and Conferences"